Race Review: Singapore International Triathlon 2015 (by Ginni Chan) | JustRunLah! 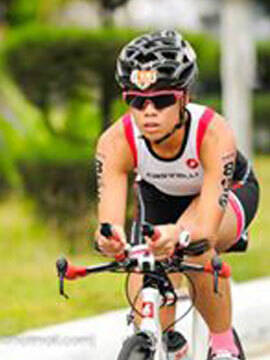 It’s been almost 3 months since my last triathlon race at 70.3 Ironman Danang. and more than 1 year in an OD distance race. 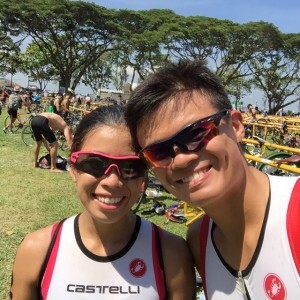 I remembered Singapore Triathlon used to be called OSIM Triathlon and the 2009 edition was my first triathlon event where I competed in the mini category with a rental mountain bike. 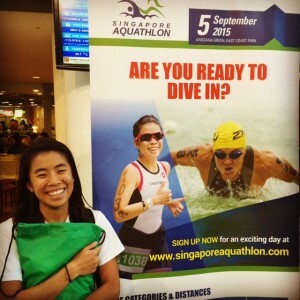 After many years, it’s called Singapore Triathlon now. This year, the event was held over a single day instead of the usual 2-day affair with Mini & Sprint categories on Saturday and OD on Sunday. My initial thought was that the race would be very crowded, messy and disorganised, but it turned out pretty well with a few hiccups here and there. My husband, Alan and I collected our race pack on Tuesday evening after work. We were given only one day to collect the race pack, and we had to skip our F1 runners’ training to do so. Upon reaching City Square, I was a little disappointed as I was expecting more merchandise booths so some shopping could be done. The official hydration was by Pure Sports Nutrition and we tried their drinks to make sure we are OK with the electrolyte given on the race day. I thought it tastes pretty good; light, not too sweet and it tastes like Ribena. So it’s a thumbs up! Yes, that’s me in the poster and Alan made me take a photo with the standee infront of the crowed which was kind of awkward. In the early morning of the race day, Alan and I woke up at about 5.30m, showered and have our breakfast (cereals) before riding over ECP which was about 7km from home. Upon arrival, we racked up our bikes and set up our transition area. Subsequently, we got ourselves familarised with the Swim in, Bike Out/In, Run Out points and using unique identifiers to identify our bikes quickly from the Swim in and Bike In. We headed over to the swim start to get our body marking done. We met our friend, Louisa who completed the Ironman Melbourne recently and had a chat with her prior to the swim start. 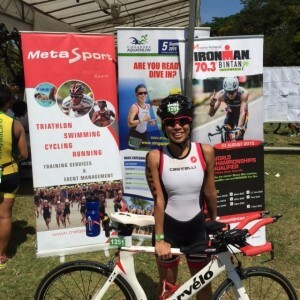 She gave us many pointers for the Ironman race such as nailing our nutrition, wetsuits and etc. The OD distance consisted of a a 2-loop swim course, 6-loop bike course and 2-loop run course. The swim was pretty alright except during the second loop where the tide started to change and I could feel myself being drifted away and had to do more sighting to stay on course. Into T1, I took my bike and began my 36km ride with one bottle of electrolyte as I left my other bottle at T1, as one bottle would be sufficient. Never did I know that within 5 minutes on the bike course, my bottle in the back cage flew out like a rocket. Luckily, it didn’t hit anyone or cause any bike crash as the bottle rolled towards the side of the road. So with that, there goes my hydration but thankfully I had a packet of GU Chomps and I took two chomps, on my third and fifth loop of the bike course. Back into T2, I was so thirsty that I took huge mouthfuls of water (that was now warm due to the heat). Less than 500m into the run, I could feel stitches in my tummy and I was like “oh god, why is this happening to me!” I guess I must have drank the water too quickly and too much that my tummy was not able to handle it. For my first loop of the run, I had to take subsequent pauses to walk or even jog very slowly to reduce the pain. By the end of the first loop, I was feeling better and decided to increase my pace a little. With that, I completed the race with a timing of 3 hours 3 minutes. I wasn’t very pleased with my performance as I knew I could have performed better in my bike and run courses and wanted to do a sub-3 or even a sub-2:50. 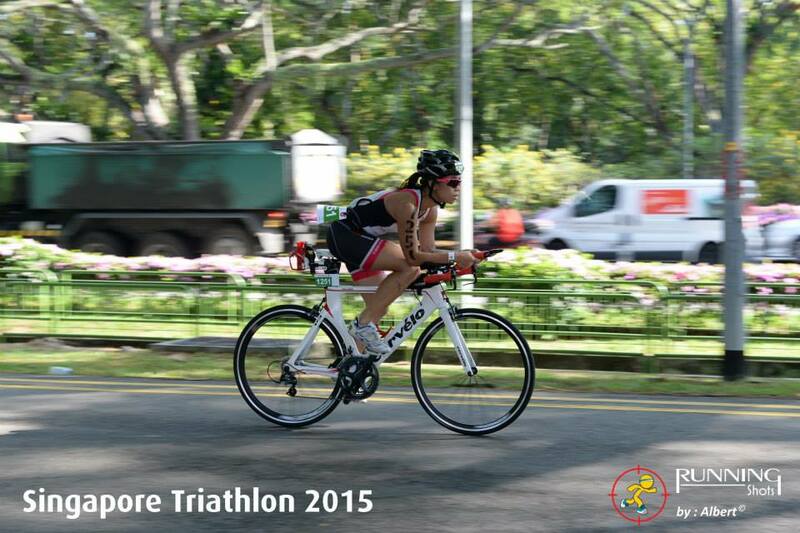 Overall, I would give Singapore Triathlon a 7.5/10. There will sufficient volunteers on both the bike and run course. The marshals will regulate the ‘bike traffic’ and inform riders to slow down if there is any accident infront. What I thought could be better was to have sufficient water. It was a hot day and there was a water station which ran out of water. Maybe having some water sprinklers along the less-shaded area would help. Given a chance, I would participate in Singapore Triathlon again next year to see if my timing had improved. Click here for more post from Ginni.